Deepen your sense of the past at sights like Shurijo Castle and Katsuren Castle Ruins. 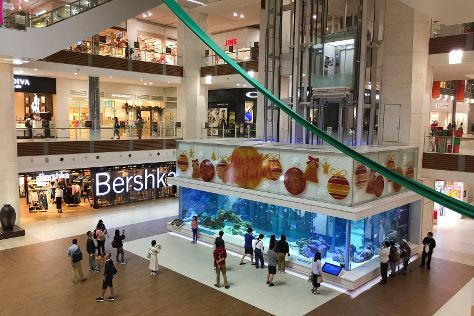 For shopping fun, head to Agarihama Market or AEONMALL OKINAWA RYCOM. You'll find plenty of places to visit near Naha: Itoman (Umanchu Market & The Tower of Himeyuri), Yomitan-son (Yomitan Village Traditional Craft Art Center & Zakimi Castle Ruins) and Sefa-Utaki (in Nanjo). There's more to do: don't miss a visit to Kokusaidori and buy something for everyone on your list at Sakaemachi Arcade. Find out how to plan Naha trip without stress by asking Inspirock to help create an itinerary. Sydney, Australia to Naha is an approximately 15-hour flight. Traveling from Sydney to Naha, you'll gain 1 hour due to the time zone difference. Traveling from Sydney in April, you can expect nighttime temperatures to be somewhat warmer in Naha, with lows of 22°C. Wrap up your sightseeing on the 17th (Fri) to allow time to travel to Hiroshima. Kick off your visit on the 18th (Sat): examine the collection at Hiroshima Peace Memorial Museum, then steep yourself in history at Hiroshima Peace Memorial Park, and then step into the grandiose world of Hiroshima Castle. Here are some ideas for day two: head off the coast to Miyajima, then steep yourself in history at Itsukushima Shrine, and then stop by Itsukushima Gekijyo. To find traveler tips, reviews, photos, and more tourist information, read Hiroshima trip planner. Do a combination of flight and train from Naha to Hiroshima in 4 hours. Alternatively, you can fly; or do a combination of ferry and train. Traveling from Naha in April, expect Hiroshima to be a bit cooler, temps between 22°C and 13°C. Cap off your sightseeing on the 19th (Sun) early enough to catch the train to Himeji. On the 20th (Mon), admire the natural beauty at Koko-en Garden, contemplate the long history of Nishi no Maru, then go for a walk through Himeji Castle, then view the masterpieces at Myochin Hompo, and finally contemplate the long history of Yoneda Taishiji Temple. To find traveler tips, other places to visit, ratings, and other tourist information, go to the Himeji route builder app . Traveling by train from Hiroshima to Himeji takes an hour. Alternatively, you can drive; or do a combination of bus and train. April in Himeji sees daily highs of 20°C and lows of 14°C at night. Finish your sightseeing early on the 20th (Mon) to allow enough time to take a train to Kyoto. Satisfy your inner culture vulture at Nijo Castle and Kiyomizu-dera Temple. Do your shopping at Dotonbori and Nishiki Market. Go for a jaunt from Kyoto to Osaka to see Osaka Castle about 1h 10 min away. There's still lots to do: take in the spiritual surroundings of Kinkaku-ji, take a stroll through Gion, contemplate the long history of Kyoto Imperial Palace, and make a trip to Heian Shrine. For ratings, maps, more things to do, and more tourist information, refer to the Kyoto sightseeing planner . Take a train from Himeji to Kyoto in an hour. Alternatively, you can drive; or take a bus. Expect a daytime high around 22°C in April, and nighttime lows around 11°C. Finish your sightseeing early on the 24th (Fri) to allow enough time to travel to Tokyo. Visit Sensō-ji and Imperial Palace for their historical value. Satisfy your inner culture vulture at Ginza and Asakusa. Next up on the itinerary: explore the world behind art at Tokyo National Museum, don't miss a visit to Tokyo Tower, ponder the world of politics at Tokyo Metropolitan Government Buildings, and take in nature's colorful creations at Shinjuku Gyoen National Garden. For photos, maps, and tourist information, use the Tokyo trip builder tool . Take a train from Kyoto to Tokyo in 3 hours. Alternatively, you can fly; or drive. In April in Tokyo, expect temperatures between 22°C during the day and 12°C at night. Wrap up your sightseeing by early afternoon on the 28th (Tue) to allow enough time to travel back home.